Thanksgiving is almost here but I haven't made anything! Had a strange experience with the US post office in Oct. I mailed a mummy doll I sold, forgot to get delivery conformation so I had a tracking number, and wouldn't you know it took 12 days for the package to show up! I was all set to refund the customer's money when she emailed that it had come that afternoon. Learned my leason to always get conformation when I mail from the post office! Never have that problem when mailing using paypal, they add it for only 18¢. The P.O. charges 65¢. I picked up a small stack of the forms you have to fill out so I won't have to do it there. I enjoyed making Halloween dolls so much I was still working on them until I realized I had better move on to winter dolls. I only sold 2 Halloween dolls this season but when I put up the winter holiday dolls I had left from last year at ebay all but 2 have sold. That was enough to get me moving. Funny thing was that I had already sorted my fabrics and had made lists of what I wanted to make but just couldn't get moving. Part of the problem was I was in the middle of making a special order angel for a customer and I was so stressed that it wouldn't come out perfect for her. This is what I do, stress and panic over everything. First I spent way too much time just thinking it over how she should be dressed, then came having to take apart a baby dress the customer wanted her dressed in. It took 2 weeks before I had the courage to cut the dress. I finally got her sent out a few days ago and I'm stressed that it still won't be ok. 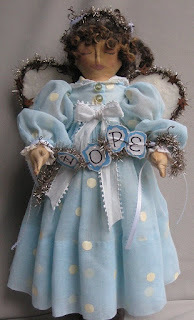 The customer, Bonnie, found me on etsy and asked if I could make her an angel like my folk art angel pattern. She loved how that one looked like her daughter who had passed away from cancer. Knowing just how special this doll would be made me freeze when it came time to make her. You know I don't think I'm cut out to do special orders, I just can't take the presure. Here's the finished doll. I think she is so sweet, but then I LOVE dots! Another slow down problem I had was last Wed. I cracked a filling and couldn't get to the dentist until yesterday (tue.). Made me misereable not being able to have raw fruits and veg because I couldn't chew right. Lucky no cavity just the filling had to be replaced and the dentist wants to cap it. Unfortunately my dental insurance only covers part of it. Guess I better get busy and make some dolls to sell, gonna owe the Dr. over $300!